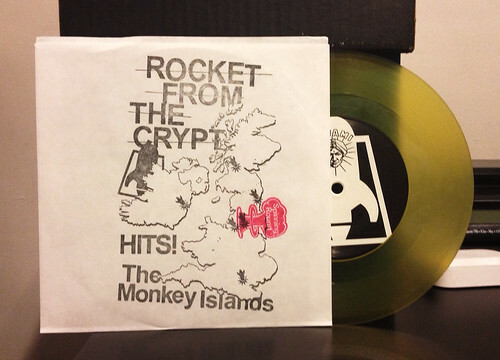 Number 4 in the Rocket From The Crypt Hits The Monkey Islands tour 7" bundle is from their December 4th, 2013 show in Leeds. For this town, they covered local band Red Lorry Yellow Lorry; a band that I admittedly have never even heard of prior to Rocket deciding to cover them. I checked out the original version of their song on YouTube and I was surprised. It's pretty forward thinking for something released in 1985. I don't know that I'll start hunting down their records or anything, but it was OK. The Rocket version is another scorcher. "Spinning Round" starts off with some octave banging, but the song is held down by dueling lead guitar interplay. It's the kind of thing that reminds me of what the band was doing on "Back In The State" or perhaps some of the RFTC era b-sides. As has become the band's trademark the horns that they've worked into the bridge sound great and it's nice to hear Speedo tossing in closing "woo" for good measure. Another great 7" and at this point, four 7"s in, I'm really feeling the need for a new Rocket full length. The band obviously still had it, now they just need to give more of it to the world. A photographic journey through the records I buy. Though I will not be buying or photographing any Journey records.